Gridwall is the most cost efficient and efficient ways to display your products. Our grid walls panels and displays are lightweight, flexible, affordable, and durable. 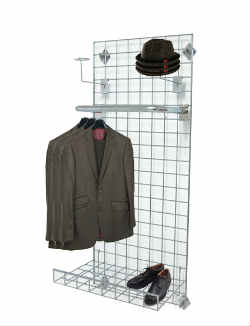 Here at Product Display Solutions we offers hundreds of easy to install gridwall products and accessories. Combine our grid wall panels with available grid accessories to create stunning displays. Check out our IDEAS page for inspiration. Available accessories consist of but not limited to: bases, panel connectors, wall mounts, wall brackets, baskets, shelves, facouts, acrylic accessories, hat - cap displays, peg hooks, notch hooks and much more. Place your order online or contact us to speak with product specialist.